A collection of essays from a wide range of disciplines, “The Social Ecology of Border Landscapes” addresses social ecologies in the marginal spaces, liminal landscapes and territorial interfaces of border zones. Social Ecology is an emerging concept situated in the field of critical social theory and new integrative sciences that addresses the complex and interrelated relationship between nature and society, offering a perspective on how environmental issues are embedded in a social context. Border landscapes are loosely defined as interstitial spaces between territories or societies, in conflict or in competition, with fixed or moving boundaries. Scholars involved in Critical Border Studies employ interdisciplinary approaches to the study of borders, often charting new territories (scapes) to analyze and intervene in the complex geography of border zones. Adding to the flourishing literature and rising interest in borders, this volume on the social ecology of border landscapes examines case studies and examples of projects that highlight such borders within a social-ecological framework. Social Ecology as a critical social theory was originally founded by Murray Bookchin as a critique of social, political and anti-ecological trends. Other proponents of a social-ecological approach (such as Samantha Stone-Jovicich, and Michael Fabinyi, Louisa Evans, and Simon J Foale) use a less idealistic approach to social ecology than that of Bookchin, urging us to consider the important role of space and its bio-geophysical characteristics that spur both ecological and social change. This attention to locally-defined spaces—be it along the Israeli wall, former Berlin wall or the Korean Demilitarized Zone— yields important human-environmental interactions and consequences that form the basis for a social ecological interpretation of environmental adaptation and change. Social ecology as a framework has expanded to include Social-Ecological Systems (SES), which emerged from critical social and resilience theories as a means of addressing the adaptive and complex structures and processes of the social and natural world. 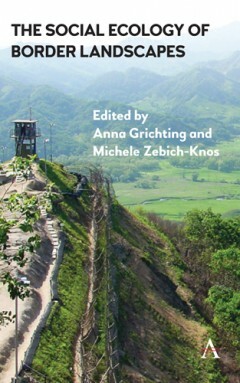 This edited volume is a collection of essays from a wide range of disciplines that address social-ecological systems, namely in the marginal spaces, landscapes and territorial interfaces of border zones. From theoretical and conceptual presentations on social ecology and its related actions or agency, to case studies and concrete projects and initiatives, the book uncovers a thread of contemporary thought and action on the important emerging field of border ecologies within the larger realm of critical border studies. The authors are worldwide scholars and practitioners from the fields of politics, ecological and environmental sciences, social sciences, geography, and urban and landscape planning. The publication explores how social agency (i.e. social action) can activate ecological processes and systems, creating new sustainable landscapes across tangible and intangible territorial rifts. To overcome the negative impacts of border creation and/or behaviors, the tangible and territorial, as well as the intangible social and cognitive manifestations of the rift must be addressed. Anna Grichting, a Swiss architect and urbanist, is currently teaching graduate and undergraduate courses in Architecture and urban planning at Qatar University. Michele Zebich-Knos is Professor Emeritus of Political Science and International Affairs, and founding Director of the Master of Science in International Policy Management Program at Kennesaw State University/University System of Georgia (Atlanta, USA). She is currently a Research Fellow at the University of Vermont’s Institute for Environmental Diplomacy and Security and is author of numerous publications on environmental policy. Introduction: Social Ecologies and Borderlands; Part I: Frames: Mapping Social Ecologies in Border Territories; 1. On the Agency of Borderlands; 2. Social Ecology and Transboundary Conservation: (Re-) Connecting Nature and People in Borderlands; 3. Social Ecologies as “Gated Ecologies”; Part II: Bridges: Resilience, Restoration and Reclamation; 4. Borders as Zones of Experiential Learning: The Case of the Balkans Peace Park Initiative; 5. Social Ecologies in Borderlands: Crane Habitat Restoration and Sustainable Agriculture Project in the Democratic People’s Republic of Korea; 6. Socio-Ecological Transformations in Riparian Zones: The Production of Spaces of Exclusion and the Uneven Development of Resilience in the Sonoran Borderlands ; 7. From No-Man’s Land to Every-Man’s Land: Socio-Ecological Approaches to Reclaiming Shared Spaces in Border Landscapes, with Examples from Germany and Cyprus; Part III: Corridors: Catalysts and Collaboration in Confined Spaces; 8. Ensuring Hope in Militarized Landscapes: The Case of Lebanon; 9. Domesticating and Enlarging One’s Territory: Day-to-Day Politics in a Confined Space—The Shu’Fat Refugee Camp in East Jerusalem; 10. Urban Alternatives and Collaborative Economics in Belfast’s Contested Space; Part IV: Portals: Dialogue, Exception and Reterritorialization; 11. Australia Day: A Social Ecology Dialogue across Aboriginal and White Cultures; 12. Re-Legislating the Soil: Enclosures and Exception at the Amazon Frontiers; 13. Mediterranean Edges: Reterritorializing Natural and Social Ecologies; Making Sense of Social Ecology, Borders and the Environment: A Conclusion; Index.